Rilastil Xerolact Concentrate Cream Sodium Lactate 30% is a highly restitutive and emollient treatment specific to reduce the accumulations of stratum corneum and contrast severe localized hyperkeratosis. 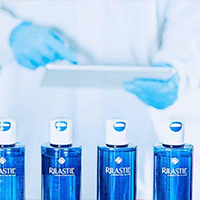 Rilastil Xerolact is a specific dermatological treatment able to restore optimal levels of hydration, the functionality of the hydrolipidic barrier and the physiological elasticity of dry, very dry, sensitive and xerotic skin. Rilastil Xerolact Concentrate Cream Sodium Lactate 30% is a highly restitutive and emollient treatment specific to reduce the accumulations of stratum corneum and contrast severe localized hyperkeratosis. Formulated for xerotic skin, it reduces marked thickening and callosity, restoring the physiological elasticity of the skin. Ideal as shock treatment, adjuvant in case of palmoplantar keratoderma, severe hyperkeratosis of the heels and of the periungual area. INGREDIENTS: Aqua (Water) • Sodium Lactate • Isononyl Isononanoate • Glycerin • Polysilicone- 11• Octyldodecanol • Dimethicone/ Vinyl Dimethicone Crosspolymer • Hydroxyethyl Acrylate/Sodium Acryloyldimethyl Taurate Copolymer • Butyrospermum parkii (Shea) Butter • Polyacrylate Crosspolymer-6 • Tocopheryl Acetate • Zea mays (Corn) Oil • Sodium DNA • Polysorbate 60 • Sorbitan Isostearate • Lactic Acid • Octyldodecyl Xyloside • PEG-30 Dipolyhydroxystearate • Silica • PEG-8 • Isoceteth- 10 • Laureth-12 • t-Butyl Alcohol • Tocopherol • Ascorbyl Palmitate • Ascorbic Acid • Citric Acid • Phenoxyethanol • Ethylhexylglycerin • Parfum (Fragrance).